When I did catch an occasional glimpse of a newspaper headline, I held my breath. Then I let it go with a sigh of relief, because the world seemed to be stuck, at last, in the blissful silly season. But there is a political struggle going on that I cannot escape by going offline. 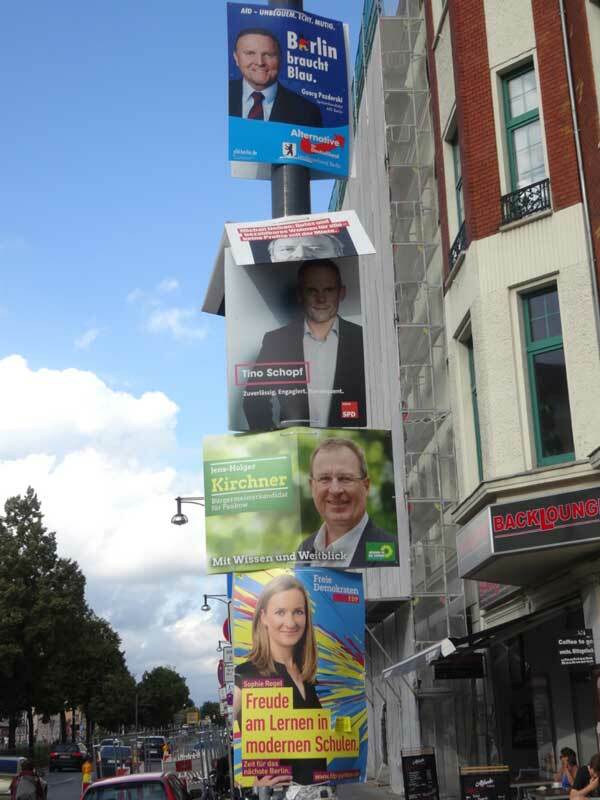 Local elections are coming up and the different parties’ campaigns have been let loose on the streets of Berlin. The campaign formats have not changed much since I was a child: Large billboards have been put up along the main roads, to be appreciated by drivers and cyclists. If you turn around after passing them, you can see how the boards lean on flimsy wooden supports. From behind, they look like the wings of a political play that is hard to sell. Smaller bills showing the candidates’ faces have been affixed to every available lamppost. Sometimes there are three or four portraits stuck above each other and I wonder how the vertical order comes about. Is it first come, first serve? And what is the best position to be in? The tired political cliché of ‘the people on top’ who don´t know what is going on ‘down here’ comes to mind as I stand in front of such a lamp post converted to a campaign pole. But the people I see up there, although they hang there by their own free will, elicit pity rather than envy. Their faces are printed on grooved plastic material that easily creases and thus distorts their features into grotesque proportions. Their frozen smiles already sport the unavoidable Hitler moustaches, chewed gum and obscene scribbles. Some likenesses have been ripped from their fixings, jumped on or thrown in the trash. These people are my candidates. In other neighbourhoods, I see different faces and the distribution of the individual parties also varies. The parties on offer seem to be a curated choice that is determined by the last election results of your constituency. I am being prompted, just like on Amazon: if you like ‘the Greens’, you might also like ‘the Left’. My candidates represent my social milieu. In fact, they look like my neighbours. These neighbours are trying really hard to look electable: Stefanie and Jens-Holger from the Green party upstairs have put some blurred, coloured lights in the backgrounds of their posters. This is to give them an urban twist, but I know they are originally from Stuttgart. Vain little Sebastian from the front building claims he owns a “progress accelerator”. Sounds like the name of the filter he has put his selfie through. Just look at the mess he has made of it. Who is the pale social democrat lurking in the background of his own posters? He always says hello in the staircase but I cannot quite place him. Is it Michael? Martin? Manfred? Teenager David is part of the CDU clan next door. I didn´t know they take them that young. He would have preferred just to have his Twitter icon on the posters, but his parents told him that there needs to be a photo. Leftie Michail – yes, it is written in the Russian way – from across the street is shown in black and white to complement the tabloid style red and white of the slogans. Grandpa Georg from the AfD is always on about locking the front door. What is he afraid of? Of refugees, social parasites, rapists, Bulgarian burglars, punks and everybody else in Berlin. The crusty Pirate with the rainbow coloured hair is called Phillip. They say he had a transgender toilet put into his office. My neighbours – I am sure they mean well, but I would not trust them to organize a street party, let alone save Berlin from privatisation, build social housing without creating ghettos, modernize education and improve the lot of the cultural precariat that I belong to. As I am about to turn away from the vertical triptych in front of me, I suddenly notice a little red sticker with white type. At first I think it is printed on the paper, but then I see that it has been stuck on afterwards. Actually it is stuck on all of the bills in front of me. Placed at the end of each hollow slogan, the sticker simply asks: “WARUM?”. All lights on green – WHY? Time for the next Berlin – WHY? Like a curious child that tries to keep an adult talking, the little red ‘WHY’ jumps at me, again and again as I walk down the street and settles in my head. Why, why, why do I not know who to vote for? Because I do not feel represented by any of them. Because they all seem to think and talk in silly stereotypes. Because they don´t have any imagination and that is why they will never come up with good ideas on how to manage Berlin. Just look at their tired campaigns, for Gods sake! I´ll tell you something: I would like to vote for the person who has put up this little red sticker here. Because they got me thinking.